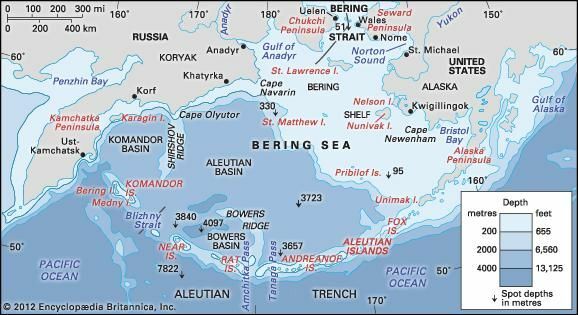 Winter storm surge flooding is the latest indication that something’s off-kilter around the Bering Strait, the gateway from the Pacific Ocean to the Arctic Ocean. Rapid, profound changes tied to high atmospheric temperatures, a direct result of climate change, may be reordering the region’s physical makeup. Ocean researchers are asking themselves if they’re witnessing the transformation of an ecosystem. Ice coverage between the Bering Strait and the coast of the Yukon Delta National Wildlife Refuge in the most recent photo is, at best, scant. This, says NASA, could soon be the “new normal”. Climate specialist Rick Thoman, from the Alaska Center for Climate Assessment and Policy at the University of Alaska Fairbanks, said that this year’s maximum ice extent is the lowest on record. Lower, even, than 2018’s – which, at the time, was deemed “unprecedented”. As IFLScience reported at the time, ice cover at the end of April 2018 was at a measly 10 percent of normal seasonal levels. Global warming is transforming the Arctic, and the changes have rippled so widely that the entire biophysical system is shifting toward an “unprecedented state,” an international team of researchers concludes in a new analysis of nearly 50 years of temperature readings and changes across the ecosystems. Arctic forests are turning into bogs as permafrost melts beneath their roots. The icy surface that reflects the sun’s radiation back into space is darkeningand sea ice cover is declining. Warmth and moisture trapped by greenhouse gases are pumping up the water cycle, swelling rivers that carry more sediment and nutrients to the sea, which can change ocean chemistry and affect the coastal marine food chain. And those are just a few of the changes. One of the risks with earlier climate predictions is that they could have easily under-predicted degree and rate of climate change effects as they could have over-predicted them. The student strikes to raise awareness of the dangers to the planet of climate change have already been very successful. They have received a lot of publicity. The protests will take place today around the country. I’m sure they will get a lot of media attention. More success guaranteed. The big challenge for students who take part will be to make this more than an event. They somehow have to sustain the attention and pressure on politicians to actually make some sort of a difference in the medium term. The media may or may not keep feeding the protests. There were major protests against the TPPA, but they turned out to be ineffective while National were in Government (to an extent they were protests against the Government with the TPPA just a topical excuse. And those protests faded right away when Labour took over Government along with the Greens and NZ First, and when the TPPA morphed slightly into the CTPPA and took effect. And that was quite a specific target. Today’s protests seem very general, so it will be easy for politicians to make general nods of support whole doing little to make much difference. Some young person on RNZ just said he read something from the UK that they are running out of fertile land in thirty years and faced starvation – I wonder if he realises that all the fertile land is not going to suddenly become unfertile. There are legitimate concerns about increasing population and growing demands for food, but food production is unlikely toi suddenly stall. 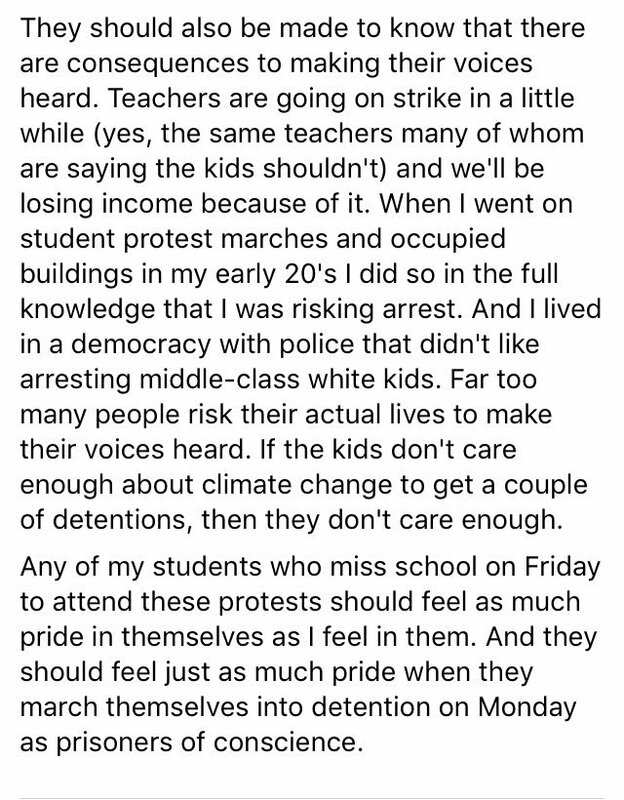 There has been months of build up, but students need to realise that there protests today are really a beginning, and not a solution. More in the build up to Friday’s climate change protests that have already been effective at raising attention. 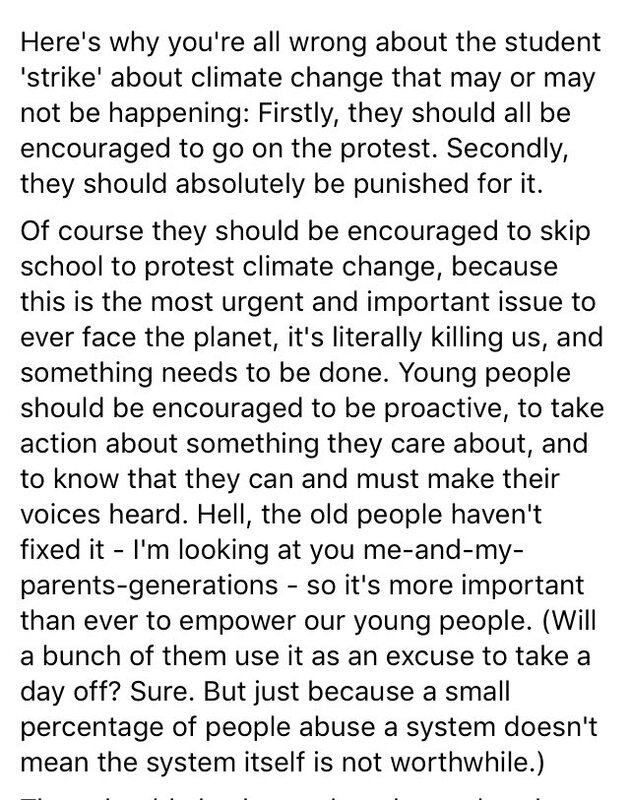 If it’s a one-off or occasional thing I have no problem with children (teenagers) taking a bit of time off school to take part in an organised protest. It is likely to inspire them a lot more than just another day at school. I was somewhat sceptical of this at first, but after reading through I see some merit in working with indigenous people on climate change, using local knowledge to combat the possible effects of climate change. It is alarming how narrowly some scientists view world problems like climate change. They are not looking to them for all the answers, but for valuable local knowledge. In the Māoriland Hub in Ōtaki, north of Wellington, an exhibition details how bad climate change will get for locals in the Kāpiti Horowhenua region, where the frequency of heavy rainfall, flooding, erosion and landslides is already on the rise. It includes a striking set of maps that draw on Māori knowledge systems of whakapapa (genealogy), hīkoi (walking) and kōrero tuku iho (ancestral knowledge) in combination with scientific data and intuitive design, to show what the local landscape will look like 30 and 100 years from now. What it could look like in 30 and 100 years. No one knows exactly how landscapes will lok decades or a century ahead. It’s part of a Massey University project co-led by Professor Huhana Smith (Ngāti Tukorehe, Ngāti Raukawa ki Te Tonga) that aims to combine knowledge from Māori researchers, architects, artists and scientists. Huhana explains that climate change is not being communicated in a way that relates to the Māori communities who are most at risk from its impacts. This has a knock-on effect on national vulnerability, so her project seeks to forge a new way of sharing knowledge about climate change, based on “mātauranga. Mātauranga is the body of traditional and contemporary knowledge about the world – both physical and spiritual – held by Māori. It is also the process by which information is observed, tested, interpreted, built upon and handed down. It is inseparable from Māori culture, values and beliefs. Māori consider themselves part of nature and within it, and mātauranga reflects this. It is useful knowledge to have, but not the only knowledge required. “Māori consider themselves part of nature” – in general perhaps. Some will more than others. And non-Māori as well, especially those who have lived and worked on the land and water through generations. This knowledge was developed over millennia and brought here hundreds of years ago by Polynesian explorers, with successive generations of Māori continually adding to it. Because it dates so far back, mātauranga can reveal things about Aotearoa – including what its climate was like before Europeans arrived – that science alone cannot. I think that science will be by far the main source of accurate historical knowledge. At last year’s Asia-Pacific Climate Change conference in Manila, speakers from Indonesia, Vanuatu, Sri Lanka, Maldives, and the Philippines discussed the merits of coupling data with the kind of knowledge held by indigenous communities to develop policies that are “local to global”. Around the world, scientists are increasingly looking to work with indigenous communities on climate change initiatives. A large-scale report that sought to quantify the contribution of indigenous forest guardians in 37 tropical countries concluded that the cheapest and most efficient way to protect forests and sequester carbon was to protect or expand the land rights of indigenous people. Abuse of indigenous land rights of is causing major problems in places like Asia and the Amazon. I think we are largely past this now here in New Zealand. In New Zealand, Niwa, Lincoln University, Massey University, and Landcare Research have all added mātauranga strands to their work, and the government’s Deep South Challenge, which will allocate more mātauranga funding in July, currently has eight Maori-led projects on the go. Together these represent the largest ever Māori-led research into climate change. Dr Jane Richardson, Massey University’s Sustainability Project Manager and Research Portfolio Co-ordinator at Manaaki Whenua Landcare Research, says that mātauranga has broadened her mind. “At first I found this project challenging as I had to learn how to adopt a more unstructured, multidisciplinary way of thinking,” she says. Climate scientist Professor Martin Manning at Victoria University recalls the first time he saw the value of having different perspectives, at a meeting for developing a major international scientific report on climate change. That sounds rather alarming. I would have thought that an essential part of good science was considering different perspectives. I’m a bit stunned too. Societal effects and responses must be a major factor in addressing climate change. Dr Harris and her team of researchers are visiting iwi and hapū throughout the country to capture mātauranga about many different plant and animal activities – such as feeding, reproducing and hibernating – to find out if these are now happening earlier or later than in the past. “We’re asking whānau if they’ve noticed anything changing in places like forests over the last 50 years, capturing this using voice recorders and writing it down,” she says. That should not be confined to Māori whanau. I have noticed local changes over the last 20 years. There will be many gardeners, especially those who have kept diaries, who will have useful knowledge about seasonal changes. Māori have a deep understanding of what wildlife activities happen when, and how these activities synchronise with the Sun, Moon and stars throughout the year. They have used this knowledge to create the maramataka – the Māori calendar – by which they also plan activities such as planting, hunting and fishing. When the kōwhai blooms, for example, this is a sign for some communities that it’s time to plant the kūmara. Liliana Clarke (Ngāti Porou, Waikato, Te Rarawa, Ngapuhi) is a maramataka specialist at SMART, working on the same project as Harris. “The maramataka is not just for sustenance but also travelling, cultural activities and rituals, and predicting energy levels for certain activities and species. It’s something that we live our entire lives by,” she says. Clarke adds that a lot of people are starting to go back to having maramataka-based food gardens, or māra kai, because they want local, sustainable food, which supermarkets aren’t supplying. There are other people doing this in different ways. There is potential for mātauranga and science to work together on making larger-scale food production more sustainable, particularly as climate change alters the environment of many crop-growing regions. Large scale food production is modern and quite different to sustainable farming, but could learn from small scale production experiences. Dr Apanui Skipper (Te Whānau-a-Apanui, Ngāti Tamaterā, Ngāti Raukawa) and Niwa scientist Darren King (Ngāti Raukawa) have been capturing knowledge from Māori communities about signs in the environment that can be used to make short-term and long-term weather forecasts. Their most recent work is with Ngāi Tahu in the South Island. “The weather and environment is very different there compared to the Coromandel and Eastern Bay of Plenty where we researched earlier, so it’s important we capture knowledge from that region too,” Skipper says. Metservice and other weather forecasters have become very good, but you need to apply local knowledge to their big picture forecasts. In Dunedin sou-westerly weather can be fickle, because fronts coming from that direction hit the bottom of the South Island and split around the land mass. Sometimes the weather comes up to coast and blasts Dunedin, sometimes the worst of it is deflected out to sea and swings back in further north. That’s why Canterbury can get heavier snow than coastal Otago. Metservice is usually very good at predicting temperature changes and the timing of fronts hitting particular locations, but is less accurate about the severity of wind or amount of rain, because this can vary a lot locally. Māori weather forecasting uses the maramataka and involves paying attention to animal behaviours and plant activities that happen when specific weather patterns, such as heavy rainfall or strong winds, are imminent. It also includes atmospheric indicators – such as the shape of volcanic plumes, cloud formations and Sun or Moon halos – along with specific smells and sounds, such as a particular bird cry. Skipper explains that Māori weather predictions are, like science, consensus-based – where the more indicators that point to a particular scenario, such as a long hot dry summer, the more confident the prediction and the more prepared communities can be. While worth considering any types of weather predictions is worth doing some scepticism is still required. ‘Red sky at night/morning’ does have some scientific basis but is not always accurate – it can be a warning but is not a promise (like scientific weather forecasts). Experts in weather forecasting once could predict flooding months ahead with such accuracy that it makes European meteorology look error-prone. But since Europeans arrived, much of that knowledge has been lost, along with many indicators – such as trees that have been cut down. I’m very sceptical about “with such accuracy”. They may well have been able to predict increased likelihood of certain weather patterns like heavy rain, but would not have been able to predict specific weather events months in advance. A problem with verbal knowledge and human memory is that it can be quite selective. It’s quite likely that over say a twenty year period flooding is predicted for five of those years but it only actually floods once – there will always be someone who says ‘I told you that would happen’, but rarely do they say ‘I was wrong again this year’. Skipper also asked communities whether they had noticed any changes over time and what they thought about climate change. “Everybody I interviewed agreed without a shadow of a doubt that climate change is definitely here,” he says. “The weather now is different from what their grandparents and great-grandparents had seen. Back then, the extreme weather events were predictable, short and sharp – but now they’re a lot wilder. It’s easier to remember sharp or extreme weather events. I remember a particularly hot and dry summer in 1972/73 – but I was working outside all summer and remember only having one day off in four months for rain. It’s normal to forget most weather. And it’s normal to remember recent ‘wilder weather’ than from long ago. I’ve noticed fewer and less hard frosts and milder winters over the last few years, which could be a sign of climate change, but have not noticed that the weather is getting ‘wilder’. Kaumātua told Skipper about seeing baby tītī (muttonbirds) starving because their parents cannot find food in the warmer water. Others pointed out that years ago, it would have been impossible to grow kiwifruit and grapes in Invercargill, yet these fruit are now thriving that far south. That could be due to better selected sites with favourable microclimates. We have several grape vines and have struggled to get good grapes, and have struggled with tomatoes, but last year I built a hot house around one grape vine and grow tomatoes in it and they are doing very well. It’s still not good for growing stone fruit where I am – but got four apricots on a stunted tree planted ten years ago. Apples and pears haven’t been great either, but two trees planted in a different place – more sheltered – are doing better. Climate change is also creating more favourable conditions for the spread of pests and diseases into new areas. Researchers are in a race against time to stop kauri dieback before it completely obliterates our unique kauri forests. Is that because of climate change, or because of the timing of the introduction of the disease? WHAT IS KAURI DIEBACK DISEASE? “Phytophthora agathidicida, the pathogen that causes kauri dieback disease, was only discovered in 2009, and formally named in 2015 (previously it was known as Phytophthora taxon Agathis). It is not certain how long the pathogen has been present in New Zealand. We have records that show it has been in New Zealand since the 1970’s and there is some anecdotal evidence that suggest that the disease has been killing kauri since the 1950s, perhaps a lot longer. There is some research to suggest that it came from overseas (probably somewhere in the Indo-Pacific), however the true origin of the disease remains unknown.”. That is contradictory. Climate doesn’t create pathogens, but it can make conditions more favourable for them to become established. Modern travel makes it far quicker and easier for pathogens to be moved around the world. While it seems clear that Pākehā and Māori knowledge can work in synergy to create more effective solutions, organisations first need to learn to value Māori expertise. There is more than climate change involved in this. And effects will vary – some forests may struggle more, some could thrive more with changing temperatures and precipitation. As much knowledge as possible should be gathered and considered – including mātauranga and other local knowledge. And it should be remembered that not all local knowledge is of equal accuracy and worth. The prime minister frequently says climate change is her generation’s nuclear issue. But so far there has not been much substance beyond the rhetoric. Certainly oil and gas exploration has been stopped, and conservation has got more funding. Meanwhile James Shaw talks a lot about climate change, and many of his suggestions scare the right of New Zealand politics. In any event if climate change is a central issue the policy can hardly be driven by a minor party. The leadership has to come from the top, from the prime minister herself. Is there an opportunity to develop a set of climate change and environment policies that will genuinely take New Zealand into a new future? Not policies that set one section of society against the other but are seen as much more uniting than that? Such policies can’t be primarily about telling us how bad we are, but rather need to appeal to our more optimistic natures. There are indications that a unifying approach is possible. Todd Muller of National, a supporter of the Climate Change Commission, seems to envisage that. Simon Upton, the Parliamentary Commissioner for the Environment, has spent his life thinking about these things. In other countries such as Denmark, Finland and Israel, where the innovation challenge was thought about much more seriously than in New Zealand, there was a unified approach that lasted beyond any one government. But the principal credit belonged to the prime minister who was in charge at the inception of the challenge and who was seen as the principal motivator and organiser of the key policies. It is already clear that the same opportunity exists with climate change and the environment. Most New Zealanders know things have to change, and they are comfortable with the notion that New Zealand should be a leader, not a follower. It is part of our nation’s ethos. When there is a $5.5 billion surplus, you might expect a more serious government commitment, say doubling the environment-focused budget to $2 billion. Sure, there are lots of competing priorities for the surplus, but the prime minister has put climate change and the environment among her highest priorities. As Ardern has said, this is the year of delivery for the Government. She has to start delivering on her own rhetoric soon. Her talk versus walk is becoming a common observation. Recent publicity about the possibility of a Blue-Green party that focuses mostly on environmental issues brought up the old arguments about how the Green Party has always been an advocate for both environmental and social justice policies. This dual purpose has been unbalanced by the relative obscurity of Green co-leader James Shaw, being very busy as Minister of Climate Change, and the activities in social media of the other Green co-leader Marama Davidson, who covers more social issues. But Davidson has linked one of those social issues, racism, with climate change. Climate change predictions based on science, historical data, and models are always going to be a work in progress on subject to corrections. Some will eventually be found to have overstated possible effects, while it is just as likely that some will be found to have understated effects. Observations claim that ocean warming has been hapening at a much faster rate than what was predicted in the 2013 U.N. Intergovernmental Panel on Climate Change (IPCC) report. New, independent observations from ocean buoys and other data sources show Earth’s oceans are warming at a rate that’s about 40% faster than indicated in the 2013 U.N. Intergovernmental Panel on Climate Change (IPCC) report. Why it matters: The study, published Thursday in the journal Science, resolves a key uncertainty in climate science by reconciling analyses from a variety of different scientific teams. The oceans are absorbing about 93% of the extra heat going into the climate system. So far, most of that heat resides in the upper ocean, and is only slowly diffusing down into deeper waters. Faster warming is already resulting in tangible, harmful impacts, from coral bleaching across the Great Barrier Reef to rapidly intensifying hurricanes. Scientists describe the ocean as having a “long memory,” meaning that the heat going into the waters now will continue to be released long after humans cut greenhouse gas emissions (assuming we do take that course). This may be adjusted again more observations are made and as more data is accumulated, but it does suggest real cause for concern. The rate of change of acceleration of warming could as easily have been predicted too low as too high, but it seems that as the science progresses, the majority of concerns increase. The study: How fast are the oceans warming? Climate change from human activities mainly results from the energy imbalance in Earth’s climate system caused by rising concentrations of heat-trapping gases. About 93% of the energy imbalance accumulates in the ocean as increased ocean heat content (OHC). The ocean record of this imbalance is much less affected by internal variability and is thus better suited for detecting and attributing human influences (1) than more commonly used surface temperature records. Recent observation-based estimates show rapid warming of Earth’s oceans over the past few decades (see the figure) (1, 2). This warming has contributed to increases in rainfall intensity, rising sea levels, the destruction of coral reefs, declining ocean oxygen levels, and declines in ice sheets; glaciers; and ice caps in the polar regions (3, 4). Recent estimates of observed warming resemble those seen in models, indicating that models reliably project changes in OHC. The Intergovernmental Panel on Climate Change’s Fifth Assessment Report (AR5), published in 2013 (4), featured five different time series of historical global OHC for the upper 700 m of the ocean. Since then, the research community has made substantial progress in improving long-term OHC records and has identified several sources of uncertainty in prior measurements and analyses (2, 6–8). shii et al. (6) completed a major revision of their estimate in 2017 to account for the previous underestimation and also extended the analysis down to 2000 m and back to 1955. All four recent studies (2, 6, 10, 11) show that the rate of ocean warming for the upper 2000 m has accelerated in the decades after 1991 to 0.55 to 0.68 W m−2 (calculations provided in the supplementary materials). The ensemble average of the models has a linear ocean warming trend of 0.39 ± 0.07 W m−2 for the upper 2000 m from 1971–2010 compared with recent observations ranging from 0.36 to 0.39 W m−2. The relatively short period after the deployment of the Argo network in the early 2000s has resulted in superior observational coverage and reduced uncertainties compared to earlier times. Over this period (2005–2017) for the top 2000 m, the linear warming rate for the ensemble mean of the CMIP5 models is 0.68 ± 0.02 W m−2, whereas observations give rates of 0.54 ± 0.02 (2), 0.64 ± 0.02 (10), and 0.68 ± 0.60 (11) W m−2. These new estimates suggest that models as a whole are reliably projecting OHC changes. The fairly steady rise in OHC shows that the planet is clearly warming. The prospects for much higher OHC, sea level, and sea-surface temperatures should be of concern given the abundant evidence of effects on storms, hurricanes, and the hydrological cycle, including extreme precipitation events (3, 15). There is a clear need to continue to improve the ocean observation and analysis system to provide better estimates of OHC, because it will enable more refined regional projections of the future. In addition, the need to slow or stop the rates of climate change and prepare for the expected impacts is increasingly evident. NIWA (National Institute of Water and Atmospheric Research) say that 2018 was the second warmest year on record, and four of the past six years were in the top five warmest. Temperatures in 2018 continued to hit record highs, with scientists calling the year a continuation of an “alarming trend”. January was a record high, but for the year it wasn’t a record. The year as a whole was the second-equal warmest on record, along with 1998. The average temperature was 13.41C, not quite reaching the high set in 2016 with an average of 13.45C. NIWA principal scientist Chris Brandolino said four of the past six years were now in the top five of warmest ever recorded, which was extremely concerning. “[The year of] 2016 was the warmest, 2017 was the 5th warmest. This year equal-second warmest and I think 2015 was the third warmest,” Mr Brandolino said. Mr Brandolino said there were 49 locations which reached record or near record temperatures around the country. Mr Brandolino said the warm weather was due to three main components – sea surface temperatures, air flow from tropic and sub-tropic areas and an increase in greenhouse gasses. “The increases in greenhouses that we continue to see is warming in the background,” he said. January 2018 was New Zealand’s warmest month on record, recording a remarkable 3.1˚C above average. 6 months saw above average temps. 6 months saw near average temps. 0 months saw below average temps. 49 locations observed record or near-record high mean temperatures. 0 locations observed record or near-record low mean temperatures. For minimum temperatures, 2018 was the warmest on record at +0.94˚C above average in New Zealand. Research has shown that historical warming rates have been larger for overnight minimum temperatures compared with daytime maximum temperatures. ‘World Scientists’ (some scientists in the world) have issued a follow-up ‘warning to humanity twenty five years after the first warning was made. On 24 November, the Emergency Plan seminar was held in Stockholm, Sweden. The aim of the organisers — WeDontHaveTime, the Club of Rome and Global Utmaning, — was to present concrete ideas on how to rapidly reduce global emissions. why the urgency? Why the desperate need for all these solutions? The speaker who most clearly answered that question was Stuart Scott, executive director for ScientistsWarning.org and board member of the WeDontHaveTime foundation. He started off by quoting a document written by the Union of Concerned Scientists in 1992. So 25 years after the first warning was formulated, scientists have written a new one. World Scientists’ Warning to Humanity: A Second Notice, was signed by 15,364 scientists from 184 countries upon release. Another 8,000 have signed it since then. The updated warning deals with ecological stressors: biodiversity loss, food systems, freshwater scarcity, marine life depletion, ocean pollution, forest destruction, air toxification, soil degradation, population and climate change. “Many of these stressors interact, and they multiply one another”, says Stuart Scott. But despite all the scientific evidence of how our lifestyle is destroying the planet, carbon emissions reached an all-time-high in 2018. But there is still hope. If we choose to act. And if we do it now. I don’t know what getting angry will achieve. I don’t know how many people will get angry about something that may play out over the next fifty years. I think there will be attempts in New Zealand this year to appear angry and to propose drastic action. there may even be civil disobedience. But how this will impact on most people – whether they care or not let alone do anything – will have to be seen, if it happens at all. I don’t want anger, I don’t want civil disobedience. I want civil debate. And I want good arguments for actions. And most of all I want a sensible, feasible plan from the Government, who should be leading the way on this. Humans should do much better at looking after our planet and mitigating and minimising risks from our impacts. But I haven’t seen anything yet that looks anything like being a convincing way to deal with things related to climate change and environmental issues. Warning to climate change activists – you need to get your words and actions right focussed on what will bring people on board a campaign for significant change, and not abuse and shame and piss off people that need to be convinced. Some scientists may be convinced that WeDon’tHaveTime, but they have to do a much better job at convincing most of ‘we’ that we have to make time to change the way we live. Minister of Climate Change James Shaw has been at the COP24 conference in Poland (he is still there, having extended his stay in the hope that something might be decided). Anything agreed on will govern countries’ efforts in adhering to their commitments under the Paris Agreement. One of the sticking points is whether efforts under the Kyoto Protocol will count towards Paris. Essentially, countries can’t agree on how they’ll count their greenhouse gas emissions, or their efforts to reduce them. Mr Shaw told reporters this morning these were technical matters negotiators had been grappling with for three years. “Frankly, they should’ve gotten past that kind of detail before all the ministers showed up for the final three days,” he said. Broadly speaking, Mr Shaw said a big frustration for him was the differences in countries’ commitments to fighting the effects of climate change. “On one side you’ve got countries who are saying that they want a set of rules that are quite permissive and lets them do things, because they’re worried about the potential impact on their Gross Domestic Product. That’s a big statement. perhaps Shaw is right, or maybe he just believes that everyone has to change to his way of thinking and living or they are doomed. It’s a bit like a religious thing – if you don’t believe in Green heaven you will go to hell.